Berlin, Aug 29 (IANS) German Chancellor Angela Merkel on Tuesday called on Turkey to release German citizens held in pre-trial detention without justification and urged Ankara to respect the principles of the rule of law. Merkel said in her annual summer press conference in Berlin that the German government had decided to pursue a new direction in its “complicated” relations with Turkey due to the latter’s disregard for due process and legal rights, Efe news reported. “We demand the release of Deniz Yücel, Peter Steudtner and Mesale Tolu,” Merkel said in reference to three German citizens (a journalist, a human rights activist and a translator, respectively) imprisoned in Turkey. She added this was also true for other detained Germans whose cases had not garnered as much public attention. According to Merkel, the relations between Berlin and Ankara were headed “in exactly the wrong direction”. The Chancellor rebuked Turkish accusations that the European Union was failing to uphold its financial commitment with regards to an agreement on refugee reception signed between the bloc and Ankara in Mar. 2016. “The EU keeps its promises; a large chunk of the 3 billion euros ($3.61 billion) that were pledged are tied to projects,” Merkel explained. As soon as the projects were completed, another 3 billion euros would be made available to Ankara, she added. Merkel said that a different clause in the refugee deal that provided for visa exemptions for Turkish citizens entering the EU could not be implemented at the moment, as Europe’s condition that Turkey amend its terrorism laws in exchange for the visa liberalization process had not been met. 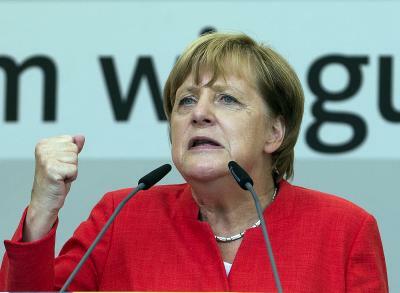 “We will have to wait and see how the situation develops,” said Merkel. Merkel is set to run for a fourth consecutive term heading the German executive in the upcoming federal elections scheduled for September 24.